It’s transfer season, one of two times of the year that football clubs are able to sell and buy players. Yesterday, Arsenal announced that they had bought former Chelsea goalkeeper Petr Cech. This did not amount to much of a surprise since the transfer had been rumoured for quite some time. We’d heard the parties were talking, then not talking, then we heard that manager Jose Mourinho didn’t want Cech to be sold to a local competitor, then that the Chelsea owner would indeed sell him because that’s what Cech wanted, and he felt an obligation to Cech. Then we heard that he’d had a medical at Arsenal. Then it went a bit quiet. When the talk first started, many Arsenal fans were happy. A key position where Arsenal need to strengthen is goalkeeping. Petr Cech had been known as a great goalkeeper who’d won the Golden Glove award several years running, but had not recently been in contention. The reason for his desire to leave Chelsea was apparent. Last summer Chelsea bought an even better keeper, Thibault Courtois, and Courtois became the #1 keeper and never faltered.That Cech had been displaced and the fact that Chelsea would part with him made some Arsenal fans begin to experience stomach aches over the impending transfer. What if there was something seriously wrong with Cech? Was he a modern Trojan horse sent over by Mourinho to enact destruction once in the Emirates? Some fans, including my husband could remember clearly what had happened that caused Chelsea to look elsewhere for a keeper in the first place. And he’s 33 years old. Not young, although not particularly old for a goalkeeper. In any case, he’s now an Arsenal player. 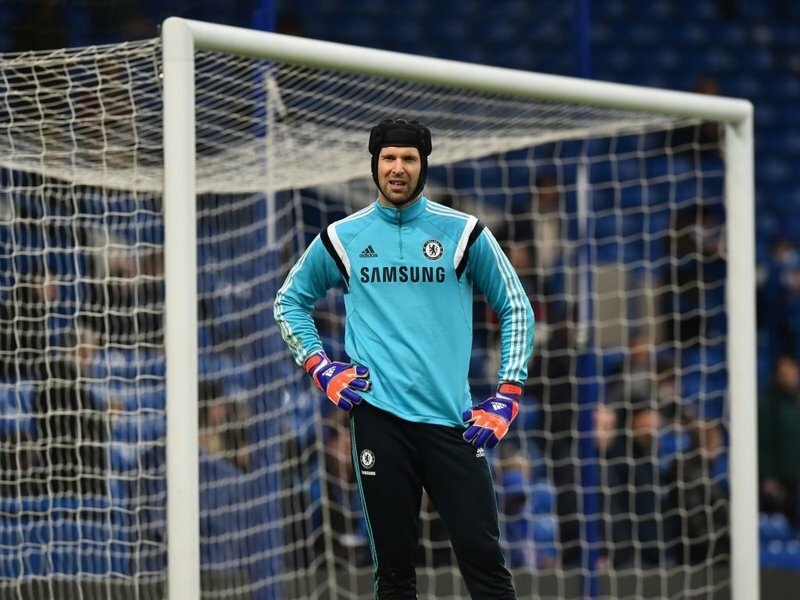 An as-much-as-we-can-muster WholeArsed welcome to Petr Cech! Cech in his hat, courtesy of Arsenal.com. So if the move was no surprise to me, what was a surprise was Petr Cech’s picture on the Arsenal website. That is because Cech was known for wearing a hat for protection against concussion, of which he’s had several. I had never before seen him hatless, and I had seen him many, many times in it. Thus, I was unprepared for seeing Cech wearing only his hair. Hair is an important feature. It has the potential to completely change one’s appearance. You’ve seen the Bosley commercials, no? (As an aside, isn’t it strange that there is so much hair replacement and Viagra advertising associated with soccer? What does that tell us soccer viewers about us?) I am intimately familiar with the importance of hair to one’s overall appearance because of the changes I’ve had to make in mine to stay a step ahead of the law….the law of aging. I am an older Mom–gave birth to my daughter at the age of 37 and my son at 41. On top of it, my hair began graying before I was 25. At first that was awesome–I needed some gray to be taken seriously in business. But after my kids were born and, honestly, after I stopped appearing young for my age, I really hated hearing people make statements that led me to understand that they thought I was my child’s grandparent. And my kids, when they got old enough, didn’t like it either. It was embarrassing to them. So I started dyeing. I’ve been brunette, redheaded, blond. Anything but gray. And though people may still assume I am my child’s grandparent, this thought nevermore comes to their lips. Mission accomplished! And so I do. For now. So back to my point. I don’t know how I thought Petr Cech would look without his hat, but it wasn’t the way he looked. As a result, I’ve done some juvenile hairstyle analysis to see if I could arrive at how I must have pictured him hatless, with the help of some genuine juveniles. 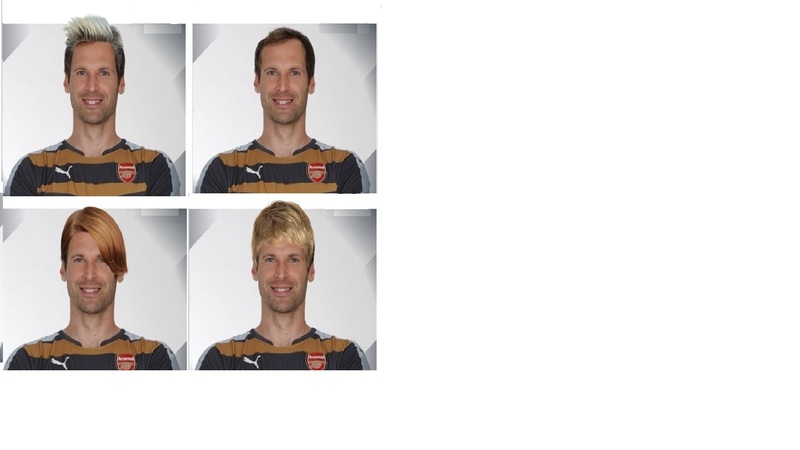 Based on the below, it seems Petr Cech was meant to be a blond.